We’d love your help. Let us know what’s wrong with this preview of Master of Paxwax by Phillip Mann. The first of four parts of a far-future drama of revenge and tragedy, involving a huge cast of humans and aliens. Seeking to bring about the fall of the autocratic, decadent, human galactic empire, the aliens manipulate Pawl Paxwax, second son of one of the eleven dynastic human families. To ask other readers questions about Master of Paxwax, please sign up. This classic science-fiction tale has now been reprinted and rereleased in the New Zealand market - and thanks to Booksellers NZ, found its way into my reading pile. Now, I do not normally read science fiction, favouring fantasy, but as the synopsis sounded somewhat like a space opera, I figured it was worth reading. Highly enjoyable, highly original, with plenty of complex political wrangling, alliances and enemies. 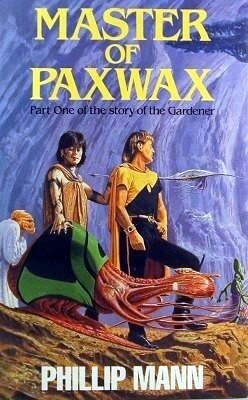 At the centre of it all, young Pawl Paxwax, suddenly summoned back to This classic science-fiction tale has now been reprinted and rereleased in the New Zealand market - and thanks to Booksellers NZ, found its way into my reading pile. Now, I do not normally read science fiction, favouring fantasy, but as the synopsis sounded somewhat like a space opera, I figured it was worth reading. Highly enjoyable, highly original, with plenty of complex political wrangling, alliances and enemies. At the centre of it all, young Pawl Paxwax, suddenly summoned back to his home planet following the death of his younger brother. Suddenly he finds himself heir of the estate, and a freak accident adds further complications to his plans for marriage and a simple life. The alien races are truly that - alien. Never described in too indepth detail, creatures like Odin and the spiderings populate the story, adding a fantastical, and slightly frightening, element. Compounded with that are the various deformations suffered by the mostly-humans. Pawl, for example, is hunched and disfigured, another bears a ruff of feathers and most seem to suffer from some sort of physical malady. Truly, Mann has brought these (slightly demented) otherworlds to life. It was a joy to sail through and the colourful characters made it a fun, even though at time precarious, journey. Though immediately sold to Pawls plight, I was left feeling not particularly emotionally connected to it, nor was there emotional pay off for me. However, I'm looking forward to continuing onto the sequel. Phillip Mann was born in 1942 and studied English and Drama at Manchester University and later in California. He worked in the New China News Agency in Beijing for two years but has lived in New Zealand since 1969, working as a theatre critic, drama teacher and university Reader in Drama.